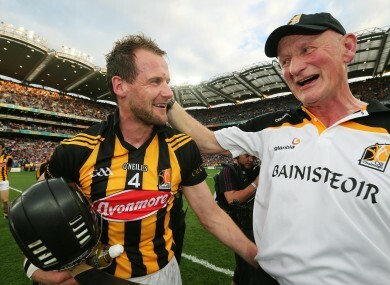 Brian Cody is planning without clubmate Jackie Tyrrell for the All-Ireland senior hurling semi-final. KILKENNY BOSS BRIAN Cody is planning without Jackie Tyrrell and Richie Power for the All-Ireland senior hurling semi-final against Waterford on Sunday week, 9 August. Cody delivered an injury bulletin at a press briefing in the city yesterday and confirmed that corner back Tyrrell and ace predator Power will not feature against the Déise. Dynamic midfielder Fennelly, a former Hurler of the Year, is also a major doubt with a persistent back problem that saw him play no part in the Leinster final victory over Galway. Cody confirmed that Tyrrell suffered a stress fracture to his ankle at training last weekend and Power, who has yet to feature this year because of a knee problem, is also a non-starter. And Cody’s James Stephens clubmate Tyrrell faces a race against time to be fit for an All-Ireland final in September should Kilkenny see off the beaten Munster finalists. “It’s hard to know how long the thing will take after the operation but they’re talking about three or four weeks for certain,” said Cody. “Obviously we’re all thinking of his hurling career, that his hurling season doesn’t end next Sunday week. “Whether we win or lose, he has club matches to fulfil as well. So we just hope that he gets back as soon as he can. “Everybody is hoping that he’ll get back as quickly as possible. But again, it’s an operation so we just don’t know. Cody admits that Tyrrell, who was below his usual high standards in the Leinster final against Galway, will be sorely missed. The 33-year-old defender brings a huge amount of experience to the Kilkenny rearguard and Cody agreed: “He’s huge. You just have to look at his record and his experience as well. Cody also confirmed that Power will play no part either as the Cats bid to reach a third successive All-Ireland final. “Ah Richie is not in the frame. Richie has had a really interrupted season this year. “He has had no game time, virtually, at all. He’s putting in terrific work behind the scenes and he’s really determined and that. “He deserves great credit for the way he’s going at it. He’s getting setbacks along the way. Midfield powerhouse Fennelly hasn’t returned to training yet ahead of the Waterford clash, Cody revealed. “Michael’s season has been very interrupted. He’s not back in training yet either at all. “He played against Wexford and played very, very well against Wexford. “He missed the Galway match and since then, his training has been limited to just non hurling. (He’s) just trying to get to the stage where he can get back taking part. Email “Tyrrell and Power out of Kilkenny's All-Ireland hurling semi-final, Fennelly a doubt”. Feedback on “Tyrrell and Power out of Kilkenny's All-Ireland hurling semi-final, Fennelly a doubt”.